An implementation of a message-passing Processor implementing publish-subscribe with synchronous (thread-stealing and happen-before interactions) drain loops. The default create() factories will only produce the new elements observed in the parent sequence after a given Subscriber is subscribed. 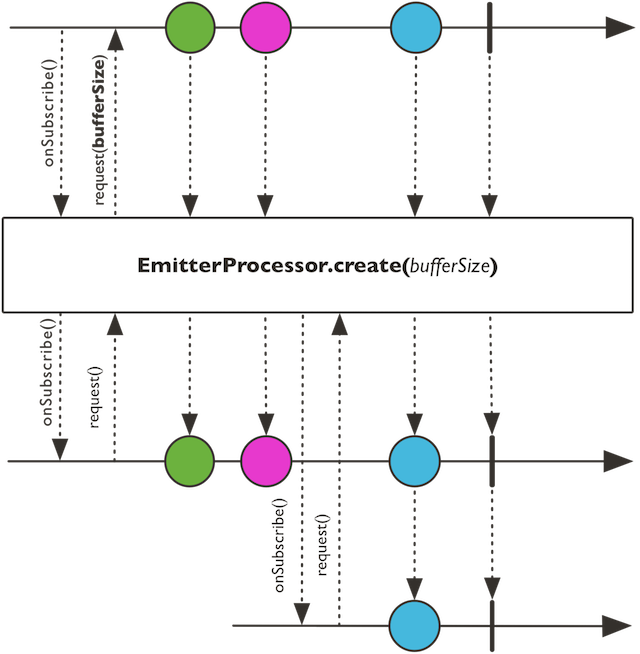 Create a new EmitterProcessor using Queues.SMALL_BUFFER_SIZE backlog size and auto-cancel. Create a new EmitterProcessor using Queues.SMALL_BUFFER_SIZE backlog size and the provided auto-cancel. Create a new EmitterProcessor using the provided backlog size, with auto-cancel. Create a new EmitterProcessor using the provided backlog size and auto-cancellation.